Does this sound impossible to do? How can I giggle while I’m getting rid of things I’ve had for a very long time and have been important to me? What’s joyful about getting rid of my kids’ favorite toys? There’s no way I can smile as I trash album after album of our family’s pictures. Right. There are some aspects to a major home downsizing that just can’t be funny. And there are other things that can be if we remain open to that possibility. Last year while I was going through downsizing from a very large house to a very small apartment, I discovered an entire box of heavy notebooks that I had used in a job I’d had 25 years earlier. Everything was totally out of date. Even if I’d wanted to use some of the material again, I wouldn’t have been able to without major updating, which would have taken longer than starting from scratch. I also found a box of index cards that contained research notes I had gathered hour and hour in the card catalogue at a local university library. CARD CATALOGUE! Probably everyone readying this blog will know what I’m talking about, but our children and certainly their children would not. I found it really amusing that I could reconstruct and even greatly enhance that research in at most two days’ time using Google. After a while I even found it funny that I was being really snippy with people I’m usually very polite and patient with. My snide, curt responses became sort of funny to me. And then I’d have to go back and apologize, but it was amusing to me at the time. What can we do to try to keep our sense of humor while getting rid of treasured things? For starters it’s probably best not to even try when we’re working with our truly most treasured things. There are many things I had to donate or sell that were very important to me, and I could not have laughed about those things. But those “truly treasured things” were a fraction of everything I eliminated from my home. So don’t focus on those things. Instead focus on those way-out-of-date things that you’re surprised are even still there. Believe me for most of us there will be many, many of those things. At a recent talk I gave to an organization on downsizing your home, a man in the audience described finding a box of copy books from his grade school days. When he first described that box, he was fairly serious. As we talked about it, it became funnier and funnier that he still had those copy books that he hadn’t looked at for at least 40 years. By the time he sat down, everyone in the audience was laughing, and I think their laugher had at least as much to do with their identifying with him as it did with his story. You also might watch for patterns to what you saved and what you apparently didn’t. For example, do you still have every single trophy or ribbon you ever won in your life. . .even a blue ribbon for that cherry pie you baked when you were 11? Do you still have all the sports memorabilia from when your children played baseball or soccer or whatever? Or what about the plastic whatchamacallits from the family trips you took when your children were growing up? Now, all that is pretty funny if you really think about it. . .especially if you’re surprised that it’s still there, which means you haven’t seen it for years. I am certainly not suggesting that a major downsizing of your home is a fun event. What I am saying is that there will be many funny or at least amusing moments if you’ll just remain open to them. And if you do, the whole process will be just a bit lighter. 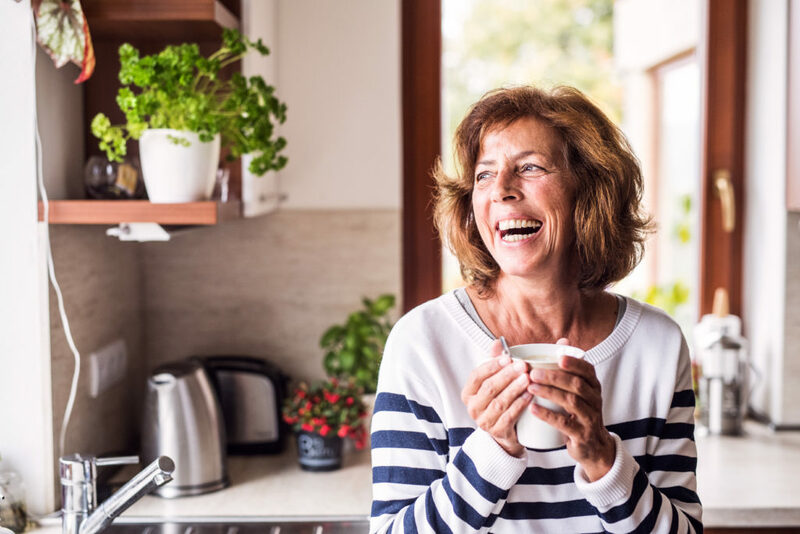 While I believe that is very true, downsizing your home can be challenging, or even painful, so consider providing yourself with some extra support. Ask a non-judgmental friend to help you. Explain to them the importance of recognizing times that could be humorous during the process. Or consider hiring a coach like myself to help you. For any of you who have completed a major downsizing, I’d love to hear about how you were able to keep your sense of humor and how, at times, it helped. And for those of you who are contemplating such a process, what can you do to remind yourself of the importance of finding humorous things?